USS Drum (SS-228) The oldest Gato-class, WWII-era, diesel-electric museum submarine in the world! "The Drum can't be beat!" The USS Drum (SS-228), a Gato-class diesel-electric submarine, has been at home in Mobile, Alabama for nearly 40 years now. Since opening as a museum on July 4, 1969, the Drum has been a silent reminder to thousands of visitors of the 52 submarines and over 3,600 submariners who made the ultimate sacrifice in WWII. Still, many people throughout the southeast United States have no idea such a rare naval WWII icon is right in their own back yard. 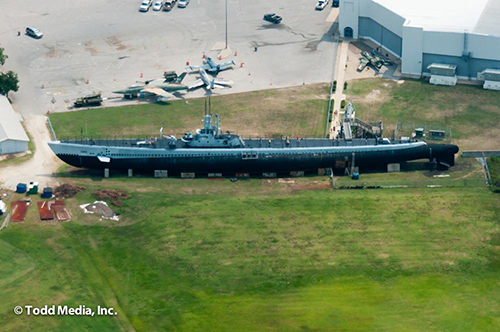 Now residing on land nearby the USS Alabama (BB-60) battleship in Battleship Memorial Park lies the USS Drum (SS-228), the oldest American WWII submarine in existence. Why not plan a trip to Battleship Memorial Park in Mobile, Alabama where you can get inside of a WWII-era battleship and the USS Drum submarine? 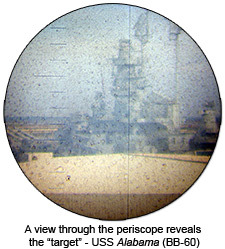 See the Visitor Info page here for more information on visiting Battleship Memorial Park as well as the surrounding area. Use the navigational links at the top of each page to learn about her past, her present, and her future. The Drum has an impressive history and a lot of character. After looking over this website I hope that you will feel motivated to pay her a visit and maybe even help out with her upkeep. You can find the USS Drum (SS-228) at the following coordinates: Latitude +30°40'52.40" North, Longitude -88°01'00.00" West. Thanks to Theodore DuBois, Ruth Hand, & Randall Sayers for this great tour video. Image used by permission Todd Media Aerial Photography. This site is best viewed with a screen resolution of 1024x768 or higher.